Akumal Breakers is a magical 4 bedroom, 3 ½ bath beachfront villa located in South Akumal, Mexico, which is the jewel of the Riviera Maya. South Akumal is located 1 hour south of the Cancun Airport between Playa del Carmen and Tulum. Besides having one of the best beaches in the area, the quiet neighborhood also has 24 hour security and a gated entrance.Akumal Breakers has one of the best beach locations in all of S. Akumal. The white sandy beach is located only 25 steps from the villa and is great for outdoor games, building sand castles or just chilling out all day and listening to the waves hit the breakers. The villa also features a large pool, plenty of beach chairs, two stand up paddle boards and two kayaks with an excellent entry into the Caribbean.If your kids want to enjoy a "real pool", then Akumal Breakers is the perfect place. The villa also has a private hot and cold outdoor shower which is a great way to clean up the children after the beach. The adults love it too!The villa is as stunning as its location on the beach. 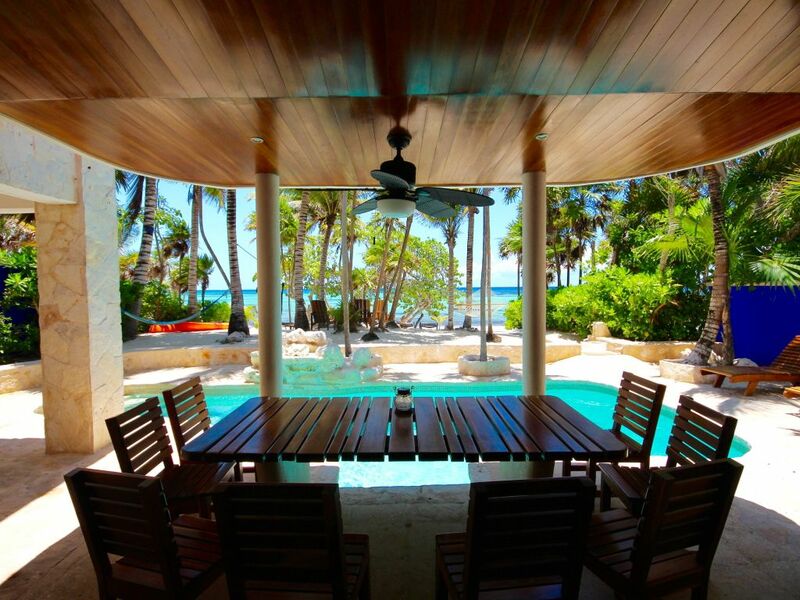 The entire villa exterior is covered with hand cut 'Piedra Maya Vista' stone making this one of the most unique and distinguished beach front properties in the area. All of the floors are made of Terracotta tile accented with Mayan wood. The villa also has a unique collection of Mexican artwork and craftsmanship including paintings, wood carvings and Onyx lamps.Akumal Breakers has a smooth sloping walkway around the side of the villa so that people with walking disabilities don’t have to climb steps to enter the living area or the beach bedroom. Although the villa is not officially ADA approved, a wheelchair can pass from the street to the living room and the beach bedroom via a gradually sloped concrete pathway.Two of the four bedrooms are considered private suites and are located on the second level. The 'North Suite' has a king size bed, private ocean front balcony, private bath and a small safe in the closet. The 'South Suite' has a king size bed, private ocean front balcony and a private bath. The "South Suite" is oversized and provides ample space for a crib or an additional Aero Bed (both are available).On the main floor, you will find the 'Beach Room' which has a king size bed overlooking the pool and the beach. There is also a large safe in the closet. The adjacent 'Garden Room' is great for children. It has two full size beds, board games, a Sony PlayStation2, DVD player and TV. The Beach and Garden rooms share a large bathroom.The villa has an on-site staff that keeps the interior and exterior in perfect shape. They can also prepare your meals for a fee and they are licensed massage therapists. You're going to love Akumal Breakers! We've traveled to more than 40 countries across 6 continents and lived in Mexico City for over 7 years. We have seen the best in hospitality management and we expect this at our private villa. We absolutely love the Mexican and Mayan culture and we certainly love Akumal Breakers. Akumal is the jewel of the Riviera Maya and South Akumal is as good as it gets. Akumal Breakers, one of the first villas built in South Akumal, is located on one of the best spots on this beautiful, quiet, semi-private beach. Each morning, we enjoy our coffee while listening to the birds and watching the clouds dance among the spectacular sunrise. Mid day views of the glistening Caribbean are unmatched. Natural Sea Grape trees provide shade only steps from the ocean which is great when watching the children. We have a large solar heated pool with non slip stone deck and we love the hot water outdoor shower. At night, we walk the beach in hopes of seeing Mother Nature at her best as large turtles often lay their eggs on our beach. As owners, we set high expectations for our trained and respectful on-site staff which is why we have a very high number of returning guests. Wonderful week in the sun. Great house, great location. The staff did a fine job and was very helpful. The one thing that we missed was a dishwasher. Great time with the kids. Beach is amazing. Luis and Mirna are both great. Recommend Jungle Fish Beach club in neighboring development for dinner. We stayed 6 nights Jan 2019. It was perfect. We absolutely loved Mirna and Luis. They are friendly and so helpful, but unobtrusive as well. Mirna made Pork Pibil for us and it was so yummy! We wished we had her cook again for us! We had 2 massages at the same time on the beach and we felt spoiled. They went out of their way to accommodate us on that. The house is very spacious and beautiful. Beds comfy. Hot water in all the showers! We travel a lot down there so that is not always the case. Everything you could possibly need in the kitchen. We didn’t use the pool as the weather was not hot enough and pool is not heated. But all you need is the ocean😄 the snorkeling was really fantastic right off the beach. The stars from the roof top are mind blowing. This location is very convenient for all the activities in Quintana Roo. Restaurant recommendations where great. Definitely recommend Akumal Breakers. Akumal Breakers was the perfect fit for three couples and two children. What a beautiful house and grounds. If we weren’t snorkeling directly off the beach, we were playing in the pool. Many good restaurants in the area, including La Lunita in Notrh Akumal and Cetli in Tulum. My grandchildren were so excited when the green sea turtles hatched under the moonlight...a magical experience. We were able to go on a nature tour by boat in the Sian Kaan Biosphere...I recommend Osprey Tours. Also, flyfished for bonefish in the same area. Mirna and Luis are the kind husband/wife team that meticulously cleaned up after we made mess. They were very accommodating, but you hardly knew they were there. Everyone in our party was sorry to leave. We had a magical vacation! Thanks so much for your kind words. We are happy your family had a great stay and that Mirna & Luis took good care of you. We appreciate your family visiting and we hope you will return in the future. We will do our best to make sure you have another wonderful visit. Thanks again! It was very beautiful and comfortable. We loved our stay so much that we stayed another week! The property was well kept, the location is amazing. Close to town, Very safe, and comfortable. We were fortunate to see turtles lay eggs and eggs hatch. Luis and Mirna are wonderful and are great cooks! We loved all the meals they prepared, especially the pork chops. Mirna and Luis were close enough if we needed help, but far enough to feel privacy. The house has all you need for a comfortable stay. Kitchen is equipped with all cooking utensils (pots and pans, etc.) We got in a bind one night as we forgot the house keys inside the house and it was Luis and Mirna’s day off, the owners were very helpful and friendly, made it so easy for us to get back in the house. We absolutely recommend this house, the pool is nice, the views are amazing and the house is super comfortable! Definitely going back! Our stay ay Akumal Breakers exceeded my expectations. Walking out the sliding doors into the pool and straight to the ocean....with a stop along the way for a massage on the beach. Can’t imagine anything better. The house was beautiful and fit our needs very comfortably- 5 adults and 3 children. We all agreed after walking along the beach that it was the best house and best location. Other Activities: Mayan ruins at Tulum, Coba and Chichen Itza. Xel-Ha only 5 minutes away. 20 minutes to Xcaret & XPlor. Deep sea fishing in Akumal & Puerto Aventuras. Golf across the street at Riviera Maya Country Club.